One recent cold January morning, Nurzhamal Moldazhanova began the working day by putting a 50 percent discount sign outside her Astana store. “I keep meaning to buy one of those clothes-tagging guns,” she said. The prices are low. One dress is selling at 1,600 tenge ($4.20), a jacket for 2,500 tenge. Nothing costs more than $30. Moldazhanova’s store, Riza, is a trailblazer in Kazakhstan’s capital. When it opened in 2016, Riza became the city’s first thrift shop. “It all started with a single rack of my husband’s old suits,” Moldazhanova recalled. The 40-square-meter, LED-lit premises are now jammed with rows of clothes for women, men and children. There is a little section for accessories and shoes. Items in the backroom are set aside for hard-up families. The name of the store comes from the Kazakh word meaning “grateful.” It is also the name of Moldazhanova’s late daughter. In 1997, the family moved from the northern town of Yerementau to Astana after Riza was diagnosed with hemophilia. Despite blood transfusions and costly hospital treatment, Riza died at the age of eight. “Her death pushed me to do something meaningful with my life,” said Moldazhanova. It was around that time that Moldazhanova was watching TV and saw a program about a woman in St. Petersburg, Russia, who opened a second-hand store. Intrigued, she did online research to look into whether she could do the same in Astana. “How hard could it be?” Moldazhanova asked herself. After an exhaustive search through classified sections, Moldazhanova found the right spot – a boutique within her budget at a department store on Astana’s right bank. Saleswomen from neighboring shops taught Moldazhanova how to use Instagram. Slowly but surely, word got around and now more than 20,000 people follow Riza’s account. With the logistics solved, it remained to overcome an even trickier hurdle. "In the Kazakh mentality, people don’t want to wear clothes that have been worn by someone else. They think that people’s spirits linger in clothes,” Moldazhanova said. Quizzing shoppers at Astana’s Mega Silkway mall confirmed as much. “My parents tell me to not wear the clothes of someone who had bad luck,” Asel Sabitova, a fourth-year university student in Astana, told Eurasianet. And as living standards in cities improve and more consumers grow aware of the current Western fashion trends, having the latest clothes is very much a matter of prestige. 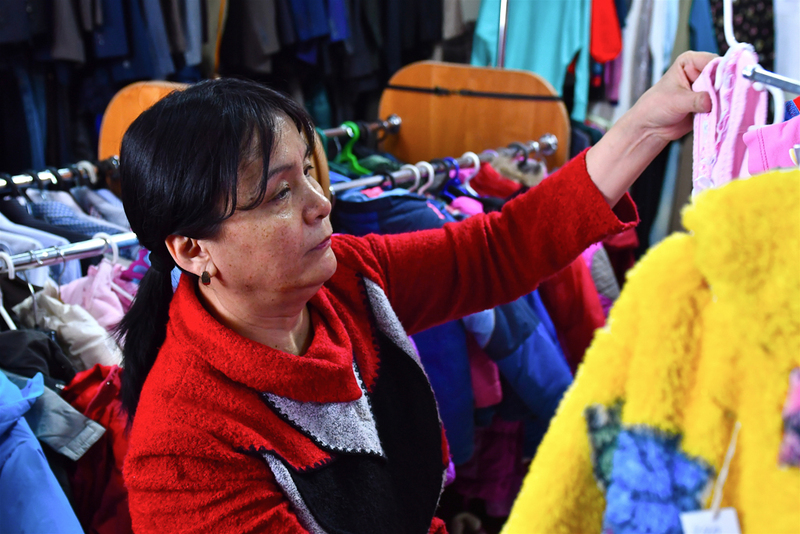 “Getting Kazakhs to wear second-hand clothes might be a far reach, not only due to mentality, but also lack of awareness,” said Sabitova. Astana’s million-strong population has more than 30 department stores to choose from. The harshness of the winter conditions in the city make malls a particularly suitable destination for family outings. Still, alternative attitudes are budding among Kazakhstan’s social media-savvy youth. When blogger Zhan Seitov realized the human and environmental cost of fast and disposable fashion, he became consumed by a desire to get rid of the mass-market clothes he owned. “I saw big brands change clothing racks on a weekly basis, and I saw how that only fueled consumerism,” said Seitov. At the age of 19, he opened a second-hand store called Yanesply in Kazakhstan’s business capital, Almaty. Seitov believes investing in timeless pieces is a better alternative to fast fashion. "If you don’t want to support the machine of capitalism and if you value individuality, the second-hand scene is ideal. Plus, you get to save money,” he said. Of course, while second-hand stores are a statement for some, they are the only option for low-income families. “Folks keep moving to Astana, but the city is not getting any cheaper,” said Natalia Konovalova, founder of Nur Alem, an organization devoted to promoting philanthropic causes. Konovalova started Nur Alem in 2009 in the basement of an apartment building. Over the past 10 years, the charity assisted more than 150 low-income families and roughly 450 children, including orphans, with food, medication, educational initiatives and clothing. “Riza is essential for our survival,” said Konovalova. Every month, Moldazhanova gives 90 percent of the donations she receives – roughly 8,000 pounds of clothes – to Nur Alem. “Without Riza we wouldn’t be able to accommodate the people we help,” said Konovalova. Riza’s future is uncertain, however. The department store that houses Riza is on the verge of bankruptcy, so Moldazhanova has to find a new space by May. And then there are months that the store makes no profit at all. “There’s plenty of clothes that people donate, but there’s not enough customers who buy them, especially around holidays,” she said. As closing time nears at Riza, Moldazhanova seeks out bare hangers on the racks and slips newly sorted clothes onto them. The week after Eurasianet visited, the price on dresses was to be dropped by another 20 percent. “Even though the clothes are already cheap, people want them for cheaper,” Moldazhanova said. As she is talking, she recalls one family of Kazakhs who moved to Astana from Mongolia. Sometimes it takes a little added charm to persuade people to make their purchase. Well after darkness had descended outside, a middle-aged female customer was browsing in the women’s aisle. “This hasn’t sold yet. Why not?” asked the lady, pointing at a heavily sequined blouse. “It’s waiting for you,” answered Moldazhanova. Aliya Uteuova is an Astana-based journalist.